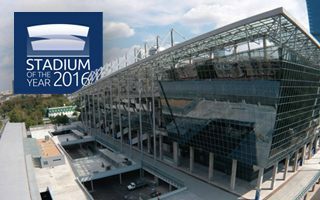 There’s no stadium matching this one in terms of height in this year’s Stadium of the Year votes. In fact, the only other stadium taller than this one worldwide is the Montreal Olympic Stadium with 170 meters, compared to 142 meters in Moscow. In case you think the skyscraper rising from south-western corner of the stadium shouldn’t be taken into account when measuring the size… it should. It’s an integral part of the building and it even fits the club’s identity. The high-rise resembles the UEFA Cup won by CSKA in 2005, first major international trophy won by a Russian club. Sure, it may seem a bit over the top as a way to celebrate international success, but when the building was planned back in 2006, demand for office space in Moscow was huge and this was a way to capitalize on it, while also boosting morale of supporters. And what’s more irritating for derby rivals than a trophy of CSKA visible from miles away? While the south-western building is the most impressive, each remaining corner of the stadium also hosts office and hotel uses, providing enough floor space for daily employment of 3,300 people (!) at the stadium. Now that’s something you don’t see too often in football! To safely combine the two uses, workers employed by various companies at the stadium enter through roads on ground level, while fans walk onto ramps and walk inside from level +1. And here’s one major attraction we enjoy as football fans ourselves. The staircases leading to upper sections are decorated with well delivered murals depicting CSKA Moscow’s legends. There’s also a tank in club colours, but that’s not entirely our thing. The stands themselves are compact and steep, though it takes a moment to get used to all the glass in each corner. Still, fans were included in selection of colours and models of the seats, making sure that there’s safe standing for most vocal supporters and more comfortable choices for others. With $350 million spent on the building, it’s probably the world’s most expensive 30,000-seater. Then again, it’s also the only one to have over 170,000 m2 of floor space for commercial use, making it a unique combination. Enough to earn your vote? If so, feel free to click here and share the below image or article with friends!